St Vincent is the starting point for most yacht charters, it is most famous for its black volcanic sand that is scattered along the coastline. On the Leeward (west) coast there are many picturesque bays that you can sail past or stop and anchor in. There is excellent snorkeling and diving at many of the bays such as Chateaubelair (an enchanted fishing village), Petit Byahaut and Troumaca Bay. These bays benefit from reefs with vast number of brightly coloured fish and beautiful backdrops. If you are looking for something a little different Cumberland Bay is a deep horseshoe shaped bay with spectacular view of the mountains, it is perfect to relax and unwind at the beginning or end of your yacht charter vacation. 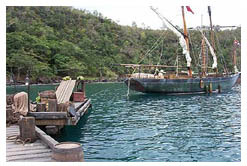 You must visit Wallilabou Bay where extensive filming for “Pirates of the Caribbean” took place. You can visit the actual set that was used and is now being maintained by Steve and Jane at the Wallilabou Anchorage Resort. This small resort offers excellent facilities for passing yachts, you can pick up a mooring for only $20EC ($8us) and have free showers and garbage disposal. They offer Breakfast, Lunch and Dinner at reasonable prices and the food is always a ‘fresh catch’. If you dine at the resort the mooring buoys are free to pick up. Try one of their delicious cocktails at the bar and their boutique is a great place to buy your gifts for the loved ones back home. The bay is deep and the two mooring buoys are in 25 and 60 feet depths, If you prefer it is fine to anchor your yacht in the bay. The Windward (east) coast is lined with volcanic rock cliffs that water tumbles and crashes against, while the elegant long black sand beaches stretch for miles. The Blue Lagoon is a stunningly beautiful anchorage that is surrounded by palm trees and a lovely beach. The anchorage offers spectacular views of the rugged green countryside, which are best enjoyed first thing in the morning as the sun rises. The lagoon is protected by a reef with two breaks in it, but only one can be used for boat entrance/exit and is well marked with channel markers. The Lagoon is normally the starting point of a charter holiday, enjoy its beauty before you set your sails for the southern islands. Bequia is the largest and northernmost island of the Grenadines measuring 7 square miles. This beautiful, diverse little island has a rare combination of hospitable people, colourful seafaring heritage and a simple lifestyle. For generations the families living here have been connected to the seafaring traditions of fishing, boatbuilding, whaling and yachting. The interior of the island has densely wooded hillsides with fabulous flora and fauna, small villages and plenty of restaurants and bars to sit and have a cold drink and a bite to eat. The island is encapsulated by golden sandy beaches and pristine waters. Each year the annual Easter Regatta sees the locally built fishing boats getting together for a 4 day race. 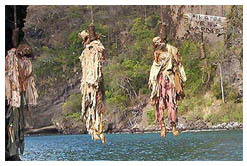 If you are chartering a yacht at this time make sure you visit Bequia during this event, you are in for a special treat! The main port of entry for boats is Port Elizabeth in Admiralty Bay on the Leeward side of the island. It is a well protected, delightful anchorage with views of the mountains and is extremely popular with yachtsman. The center of the bay is very deep and the sandy bottom is hard, be sure to anchor well and make sure you pay out enough scope as the wind can sometimes channel through the hills. Marine facilities in Bequia are excellent and have amenities including showers, laundry services and Internet, charterers are always welcome. Princess Margaret Beach (named after Princess Margaret in 1958) is on the Leeward, south side of the island, this beautiful anchor spot has crystal clear waters and a perfect golden sand beach. There is a dinghy dock along the water front path just around the northern headland where you will find Frangipani, a small hotel. They have an open-sided dining room and a very popular beach bar. Make sure not to miss “Happy Hour” and on Thursday nights they have an eat all you can BBQ and a steel band. Water taxis are also provided here by the locals, so if you prefer to be picked up from your yacht this is no problem. At the far end of the bay you will see an amazing archway of natural rock leading into a small, sheltered cove. 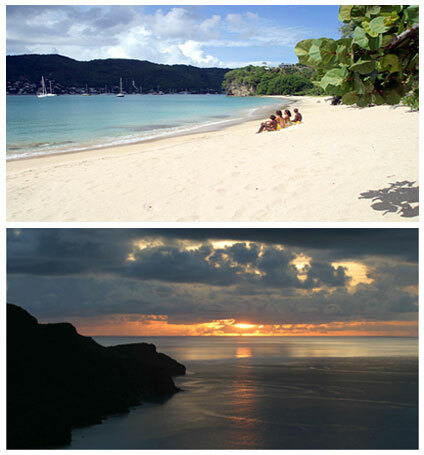 Lower Bay is not to be missed; it is one of Bequia’s best beaches. A wide stretch of white fine sand, clear blue waters and a small reef ideal for snorkeling and swimming. Many restaurants and bars can be found here and De Reef Restaurant often has a live band on Sundays. If you anchor your yacht here there is a good chance of some swell so it is recommended more as a day anchorage. Friendship Bay on the windward, south –eastern coast has a wonderfully long cured golden sand beach. The anchorage is protected by its semi-circular shape and a good spot to anchor is close to the east side of the bay just south of the Hotel and dinghy dock. The Friendship Bay Hotel has two excellent restaurants, Moskito and Devil’s Table; charterers are always welcome at both. This anchorage is perfect to sit and relax while enjoying the views of Mustique, the tiny islets of Whale Cay, Semple Island and the stunning Petit Nevis in the background. Bequia is a diver’s paradise with around 20 dive sites there is always plenty to see. The clear waters and abundance of fish make the experience one you won’t forget. 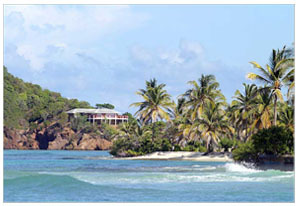 Winter home to the rich and famous, Mustique is a beautiful display of hills, valleys, peninsulas and golden sandy bays. This privately owned small island is 3 miles wide and 1 mile long, and was once a cotton and sugar plantation. It’s 1400 acres now has over 70 luxury mansions built on it and only one luxury 20 bedroom hotel and a small guest house. Charter guests have often seen famous stars when sailing into Mustique, Mick Jagger, Princess Margaret and David Bowie to name just a few. 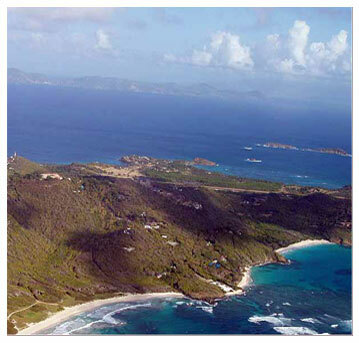 The island is owned by the Mustique Company and they control the island to protect its natural beauty. As a charter yacht you have the benefit of nine gorgeous beaches, quiet anchor spots and no cruise ships passengers to clutter the beaches. A good stop for charter yachts to collect extra provisioning is Britannia Bay, if you do not feel like cooking dinghy into Basil’s Bar and restaurant and sip a cocktail while you watch the vibrant colours of the Caribbean sunset. Just anchor your boat, swim, snorkel, and sunbathe while you take advantage of the sheer relaxing ambiance of this pretty little island. Canouan is the third largest Island in the Grenadines Chain. It gets its name from the Arawak meaning turtle. Fresh water turtles can be found all over the island and sea turtles inhabit the surrounding reefs. This beautiful island is shaped like a boot and measures 3.5 miles by 1.25 miles and has a barrier reef running along the Atlantic side, a decade ago it was only known to adventures and yachtsman. Small but diverse Canouan offers charterers aquamarine sailing waters, spectacular hillsides in the north, a 18 hole golf course and unforgettable diving and snorkeling. Charlestown Bay, also known as Grand bay, is the main anchorage of Canouan Island and is situated on the Leeward (West) Coast. This large bay has a marked entrance/exit channel for yachts and you can either anchor in the bay or if you prefer you can pick up a mooring buoy provided by Marcus at Tamarind Beach Hotel for $15USD(Contact Marcus on VHF16). Charterers can use the dinghy dock provided at Tamarind Beach Hotel, making it easy to visit this picturesque island. The anchorage can have some swell if the wind is from the north and you can expect wind gusts from the hills. The holding here is fairly good and the bottom is sand. If you can tuck the yacht up into the north end of the bay behind a set of rocks and small reef you will find that this is the best anchoring spot. Rameau Bay is located just North of Charlestown and is a pleasant and quiet anchor spot. The wind here shifts around and it is advisable to use two anchors, do not be surprised if you have to anchor several times before your yacht holds. This is a popular bay with charterers as you can swim around the rocks and the snorkeling is very good. Corbay is one of the most sheltered and protected anchorages on the island. Cargo does arrive in this bay so be careful where you anchor, but you can anchor off the landing dock if you wish. This bay can get noisy when cargo is being unloaded. Snorkeling and swimming are great here. Maho Bay is on the northern tip of Island and due to the trade wind direction this anchorage is not well protected. As you enter the bay the reefs can be found on the eastern side of the bay and snorkeling here is excellent. Charterers should anchor the yacht towards the western side where the ground is sand and holding is fair. The beach at Maho Bay is beautiful and well worth a look. The Windward (East) side of the island has a reef running all the way down it. If you wish to anchor on this side you can do so at Friendship Bay. Charterers anchoring here will be able to dinghy along the windward side of the island inside the reef. The beaches along this stretch are incredible and if you love snorkeling this is the place to be as you can stop anywhere along the reef. You will see an abundance of fish, sponges and soft coral. Always be sure to drop your dinghy anchor in sand and not on the coral. 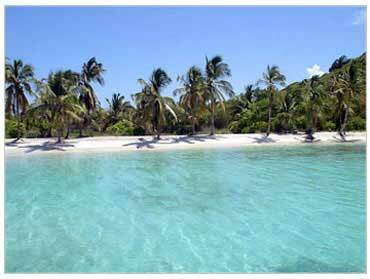 Mayreau is a small island that lies in the middle of the Grenadines. With its pristine long, curved soft white sandy beaches and clear crystal blue waters it is a delightful stop for any yacht. With only around 250 inhabitants this little island always has welcoming faces. There are two main anchorages on the Leeward (West) coast of the island. Salt Whistle Bay has a sweeping half moon beach and is a favorite with charterers as the waters are clam. Make sure you enter through the central channel as there are reefs on either side; it is a good place for snorkeling. You can pick up a mooring and dinghy into the two dinghy docks available. Charter yachts are advised to check prices before picking up these moorings. Saline Bay has another long, sandy beach. You can also anchor here but the lights from the electric-generating plant do shine brightly at night. Another anchorage is available on the Windward (East) coast of the island, you must approach this anchorage from the south as once again you have scattered reefs. Make sure you study your charts carefully and always anchor in good light. The Tobago Cays are a spectacular vision that are untouched and hold many magical qualities. There are five cays in total, four small uninhabited islands inside the Horseshoe Reef (Petit Rameau, Petit Bateau, Baradal and Jamesby) and the fifth island lies just outside the reef (Petit Tabac). Charterers and cruisers love the Tobago Cays; they offer some of the most amazing reefs you will ever see. The shallow water and reefs makes an exceptional display of shades of blues and greens, while the two mile diameter reef is home to over 90 varieties of tropical fish, making it some of the best snorkeling ground in the world. The fish that can be found here include Angelfish, Butterfly fish, Grouper, Grunts and Hamlets, to name just a few and with this kaleidoscope of colour you will never want to get out of the water. The powdery white beaches lined with palm trees and the sparkling sky at night make these islands a tropical paradise. The cays are a national marine park so nothing is to be taken from these waters. Black and white day markers have been placed in the water to guide yachts in. You will also see sectioned off buoyed areas, these are turtle feeding grounds. Due to the number of visiting yachts blue mooring buoys have been placed near the reef for dinghies so that anchors do not damage the coral. It is important that you use the buoys provided. At the cays you will find the boat vendors, they will come around the yachts to sell you lobster, fish, bread, ice and other provisions and gifts. The vendors are friendly, Ken (Free Willy), Larsten (Seckie), Jean-Claude (Mr Fabulous), Walter Bob (Has a gold tooth), Rondel (Mr Quality), Sydney, Tyrone and Tuffer are the main Vendors you will see. They are all very friendly and if you are looking for good lobsters speak to Tuffer on the boat named Desparado; he is very reliable, well respected and is the largest lobster vendor on the cay. Petit Rameau is the Northernmost of the four islands inside the reef. Anchor in the cut of Petit Rameau and Petit Bateau, you can then dinghy onto the island. On the south side of the cay you will find a curved shaped beach and scattered rocks all around the island. Be very careful not to cut the corners at the day markers as you may end up on a coral head. Petit Bateau is south of Petit Rameau, the two beaches on this cay lie one to the north, in the cut, where you will usually find make shift stalls with gifts for sale. The other is on the east side; it has a white sandy beach and has calm shallow waters that are ideal for beginner snorkelers. When anchoring in-between these two islands use two anchors as the current can be quiet strong. Baradel lies to the East of Petit Bateau, is an excellent place to encounter turtles as the sea grass provides a good grazing ground for them, the hawksbill turtles are frequently seen here. Your mouth will water when you smell the fresh fish and lobster being grilled on the beach at the south end of the cay. This is a regular event held by the Vendors. The white sand, clarity and shallow depths makes the water on the Windward side of Baradel a brilliant turquoise colour. The color of the water on the windward side of Baradel is a brilliant turquoise as a result of the clear water, white sand bottom, and shallow depths. The effect of the colors can only be fully appreciated from up close, so a pass through by dinghy should be on your list of things to do. There are 3 anchorages around Baradel, on the Southwest corner you will find depths of around 25 feet to anchor in and the holding is reasonable, due to the depths you can tuck your yacht right up to the cay. North Baradel is fine to anchor in very light winds and on the windward side there will be nothing between you and Africa except the Horseshoe reef. Anchoring here is often quieter than on the Southwest side and it places you close to the snorkeling area, however, it can be much windier. 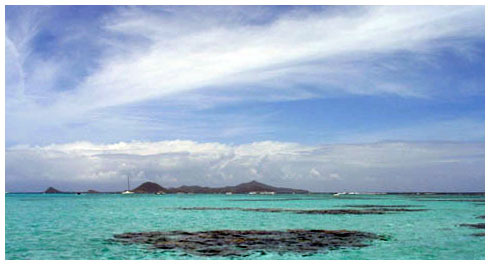 Jamesby is the smallest and southern most cay of the Tobago Cays inside the reef. On the eastern side of the cay it boasts the prettiest beaches of the Tobago Cays. The beach has fine white powdery sand and the water around it is crystal clear a perfect place to swimming and snorkeling. Petit Tabac is the cay outside of Horseshoe reef. This small cay is surrounded by reef and coral heads, be very careful when approaching. The best way to see this spectacular island is by hiring a boat vendor as the ocean swell and current is very strong. Anchoring here is rare as there is no protection. This unique island is well worth a visit, Johnny Depp, as Jack Sparrow was marooned here in the film Pirates of the Caribbean. Due to its volcanic silhouette and its dramatic mountainous outline Union Island is also known as the Tahiti of the West Indies. The island is approximately 3 miles long and 1 mile wide and Mount Parnassus is the highest peak of the island at 900 feet above sea level. Union island offers a bustling town, great hiking in green tropical vegetation and beautiful deserted beaches. Clifton Harbor is the main anchorage for Union Island. The harbor is protected by Newlands reef which should be carefully maneuvered around when entering the harbor from the north side. If you are approaching from the south you will need to stay clear of Grand de Coi. Just behind Newlands Reef is a pleasant anchorage but if you prefer to be nearer the action you can anchor anywhere off the town. The Anchorage Yacht Club offers dockage, water, ice, showers and a laundry service if you need it. They also offer a free collection of garbage if you stay with them. Yachts anchoring here will be open to the east but protected by the barrier reef, the water colour is brilliant green and turquoise and you will have such clear water that you will be able to see your anchor dig. Chatham Bay on the leeward (West) coast of the island is a magnificent bay with a long beautiful beach backed by steep hills. Charterers can anchor their yacht here and be protected from the prevailing winds. The anchorage feels wild and far away, it is the perfect place to swim, enjoy a grill and relax while you catch that golden bronzed suntan. Frigate Island is on Union’s south coast and fairly remote, though well within dinghy range of Ashton, Union’s other main settlement. This anchorage offers great snorkeling around Lagoon Reef and is a well protected anchorage. Bloody Bay is on the north west coast, there are good depths going into this bay and it offers a long sandy beach and lovely views. Richmond Bay is also on the north coast, this bay is shallow and perfect for children to swim in. 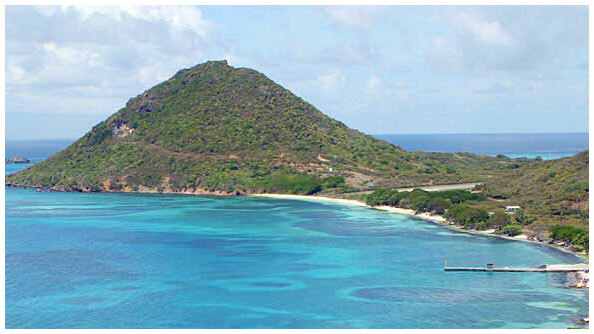 Petit St Vincent is the last island of the Grenadines chain belonging to St Vincent. The island is 113 acres of soft rolling hills and two miles of white sandy beaches is a luxury private resort with 22 cottages owned by Haze and Lynn Richardson. They warmly welcome yachtsman to the island but ask you to respect the privacy of the paying customers staying at the resort. Dining here is a treat but you will need to make reservations in advance. There is an anchorage on the North side, it is exposed to the wind but the reef breaks all ocean swell. This perfect anchorage has good holding and you will be able to swim to the reef from your yacht. The Pristine beaches sparkle with white sand and are a great place to lie out your towel and enjoy the tropical heat. Anchoring in the shallows just southwest of the dinghy dock will be one of the most spectacular patches of water you will ever anchor in. The white sandy bottom and brilliant sunshine creates a dramatic emerald, turquoise and deep blue colour pattern that you will not find anywhere else. At night your yacht lights will reflect from the clear water and you will feel like you are floating in a reflective swimming pool.